Join one of the most exciting voyages in the world as you sail across the Atlantic Cape to Cape via Antarctica. This is probably the most bucket list inducing adventure on the high seas. An ocean voyage to a remote and rarely visited part of the planet on a world class traditional tall ship where you are the crew. This trip starts in the Ushuaia Argentina and sails transatlantic to Cape Town in South Africa with remote Atlantic island stops and exploration in Antarctica. The Cape to Cape voyage is an adventure for all nature and sailing lovers. The places you’ll land offer a remarkable wildlife with unique species, sometimes in surprising quantities. Your voyage offers all nature lovers a special opportunity to meet with some of the most unspoiled environments of this world. During this 52-day voyage you will visit a number of remarkable areas like the South Shetland Islands, the Antarctic Peninsula and the Weddell Sea with her many icebergs. This voyage is the perfect combination for those who wish to admire nature on some of the most remote places of the earth end experience the wide open ocean during the longer periods sailing at sea. After your visit to Antarctica you will sail towards the sub-Antarctic island South Georgia with its spectacular scenery and outstanding wildlife and then on to the remotest inhabited island of the world: Tristan da Cunha. Here, in the middle of the Atlantic Ocean, lives a small community on top of an active volcano. Your voyage ends in the South African capital Cape Town. Your vessel is a sail training ship which means you will be mustered as voyage crew. But don’t worry, you’ll receive thorough safety training. Being part of the crew is definitely a major part of this amazing experience. And what’s great is that no prior sailing experience is necessary. This is an adventure open to everyone. While on deck you will work side by side with the permanent crew. Join the watch system, take the helm, assist with maneuvers and navigation, make the weather observations, learn to furl the sails, and so much more. Lectures will be given regarding basic sail theory, watch responsibilities, line handling, navigation, and steering. You’ll be an old sea-dog in no time. Your level of participation will partly depend on your interest level as well as your physical condition. Everything on board is done in a “Dutch” style which means no yelling or whistle blowing just good team work. As you can imagine, a transatlantic crossing is a team effort. It won’t take long at all before your fellow voyage crew feel like family. And unless you think it’s all work – your vessel has plenty of places and opportunities to relax. There’s a lounge, library, deckhouse, and even a poker corner. Find your spot and kick back to feel the wind in your hair and dream big out on the wide blue ocean. Places on this incredible voyage are extremely limited so get in touch if you’d like to be part of this amazing adventure. Bookings for 2019 open on June 14th 2018 at 12.00 hrs (midday) CEST (Central European Summer Time). Any bookings received before this time will not be processed to give everyone a fair chance. Make an enquiry for the full details on how to book. Please note there are only 3 cabins for 2 people and these are reserved for those travelling in pairs and applying together. During this 52-day voyage you will visit a number of remarkable areas like the South Shetland Islands, the Antarctic Peninsula and the Weddell Sea with her many icebergs. After your visit to Antarctica the ship will sail towards the sub-Antarctic island South Georgia with its spectacular scenery and outstanding wildlife, followed by the remotest inhabited island of the world: Tristan da Cunha. Here, in the middle of the Atlantic Ocean, lives a small community on top of an active volcano. Your voyage ends in the South African city of Cape Town. After your first night on board, the crew will cast off mooring lines early in the morning and start sailing the Beagle Channel. This channel is named after Robert Fitzroy’s ship, whose second voyage here brought along a solitary guest acting as the naturalist on board, a young man who would revolutionise the way we view the world - Charles Darwin. The Channel was also defined as the southern border between Chile and Argentina during the 1881 Boundary Treaty. Once on our way, a mandatory safety drill will be conducted, followed by several introductory talks by the crew to further famili- arize you with the ship and her many lines, the watch system and your tasks on board. Some people become interested in Antarctica after reading about the voyages of Ernest Shackleton and other expeditions. Others are more fascinated by the rich wildlife or the beauty of the unspoilt natural environment. Antarctica is one of the oldest continents on our planet, but man has always been unable to live here because of its extremely cold climate. Albatrosses and petrels will accompany the you on your way to the Antarctic paradise. After passing the Antarctic Convergence Zone, the ship sails between the icebergs to the South Shetland Islands. The wildlife is overwhelming: seals, sea-gulls, cormorants and petrels use the Antarctic summer to raise their young. In the Antarctic waters, you will anchor in sheltered bays practically every day. The crew will take groups ashore in the dinghies to see glaciers, mosses and lichens, seals, birds and penguin rookeries. Ashore, visitors will often be welcomed by different kinds of penguins, such as the Gentoo, Chinstrap and Adelie penguins. The experienced guide will give you information about the flora and fauna and will also tell you where to find bird and sea elephant colonies. The ship will sail further south. It's expected that the most loyal visitors of the Southern Ocean: enormous Humpback whales; Minke whales and even Orcas or Killer whales may well come close to us, curious to see who ventures into their waters. Ice masses will get bigger closer to the mainland. Steep glaciers, walls of ice with magical shapes and surreal colours will surround you on board. Soon we will spot the South Shetland Islands, our first destination in Antarctica. Some examples of islands we may visit of the South Shetland archipelago could include Barrientos, Half Moon, Greenwich or Livingston Island. All of them are home to impressive penguin rookeries, including Gentoo and Chinstrap penguins and several species of other birds and seals. When we arrive in Antarctica the watch system for voy- age crew is discontinued for a while so everybody can enjoy the most of landings on shore. South Shetlands geology is also very interesting, as sedimentary layers rich with fossils are mixed with posterior volcanism. The Weddell Sea is known as an area where the breaking off of vast ice shelves produce large tabular icebergs. These huge icebergs drift away with the currents and winds, offering a magnificent view to lucky observers. The weather, the winds and the state of the sea dictate our sailing, speed and progress. But especially in Weddell Sea, the ice conditions play a key role on our scheduling. The last few years there was simply too much ice to pass the Antarctic Sound and the ship spent some extra days on the Antarctic peninsula. The captain and the expedition leader will try to find the best places to anchor, land or cruise between the icebergs and pack ice. You may encounter Gentoo and Adelie penguins on our way and have the chance of sighting the rare Snow and Antarctic Petrels as well as Weddell, Leopard, Crab-eater and Elephant seals, and if you keep a good eye on the sea, there is a chance to spot Minke and Humpback whales, or if you’re very lucky, even a pod of Orcas! After your visit to Antarctica you will sail towards the sub-Antarctic island South Georgia with its spectacular scenery and outstanding wildlife. Once in South Georgia, you'll have approximately six days to enjoy this remote and spectacular oasis in the Southern Ocean, offering one of the best wildlife spectacles on earth. You'll find the remains of a former whaling station at Grytviken and see the grave of Shackleton, one of the most heroic pole travellers. It is an old tradition to drink a glass of whisky near his grave. Time for some classic sailing on board of this beautiful ship after leaving South Georgia. The plan is to visit the remotest inhabited island of the world: Tristan da Cunha. Here, in the middle of the Atlantic Ocean, lives a small community on top of an active volcano. The archipelago’s extreme isolation has lead to a very unique plant and wildlife community. Many species are endemic, meaning they are found only on these islands and nowhere else in the world. The final leg of this long voyage is a beautiful sail to Cape Town. It takes about 12 days to sail from Tristan da Cunha. You will experience your transoceanic sailing trip in the same style as the sailors in historic times. The last part of the expedition to Cape Town is 1510 NM. The predominant winds are still westerly. Everyone is adjusted to the ship and experienced with the sea in his own way. The ocean is different for the birdwatcher, the biologist, clerk, or sailor. It depends on what you are looking for. Finally, Table Mountain will appear on the horizon and the ship will be berthed along the quay in the Waterfront in Cape Town. It is time to say goodbye to the ship and to life on board. It will be difficult to get used to normal life again. 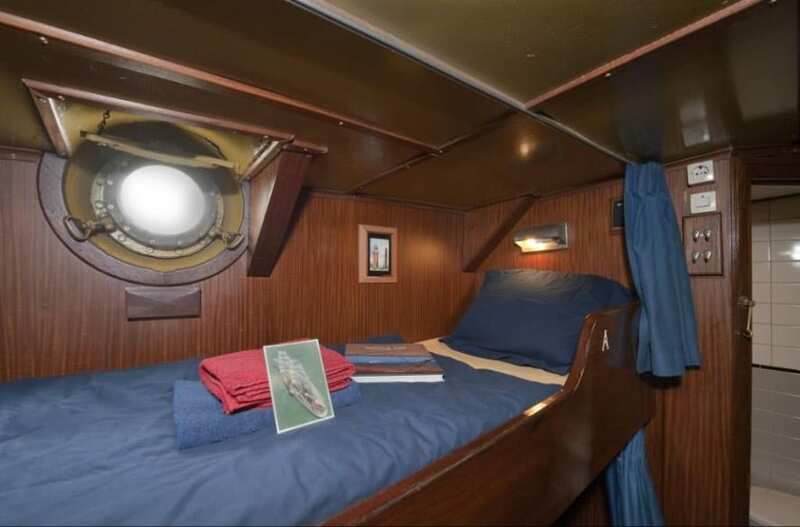 9,160 EUR for a berth in a 4-6 person cabin. 10,230 EUR for a berth in a 2-person cabin (reserved for couples or those travelling together). The ship is ideal for ocean crossings and longer voyages, with various places for relaxing: library, lounge, poker corner and deckhouse. These different areas allow you to do your own thing. Perhaps some quiet reading or a more active role in the social life in the deckhouse. In the aft of the ship you have the library. This is usually the most quiet place of the ship so ideal to read a book or work on your own logbook. On tweendeck level you will find the lounge. Breakfast is served here but this room also is used by the guides to have their lectures and show their movies. In the deckhouse you will find the ships bar and nice benches to meet your fellow crew. There are four 2-person cabins, four 4-person cabins and four 6-person cabins. The classic bunks are very comfortable. Every bunk has its own sheet, duvet and covers. You do not have to bring your own sleeping bags. Towels will be provided too. All cabins are provided with ensuite shower and toilet. At sea it is very important to eat and drink well. An experienced cook and cooks mate prepare excellent meals every day. You will be suprised by the variaty of dishes. The cook will often use local ingredients from the ports we visit. And if allowed a fresh caught fish will be on the menu as well. During the day there are fixed coffee and tea breaks (10h00, 14h00, 16h00 and 20h00). Of course coffee and tea is available to you all the time. Meals usually are served with dairy and juice. We recommend you to bring a waterbottle from home which you can use to (re)fill with water. If you are vegetarian or suffer from a food allergy please let us know on the booking form. The cooks on board the ship are very creative and serve a broad variaty of menu’s. However due to the size of the galley, the possibilities are limited and for example, the ship is not able to cater for vegans. It is possible to request a vegetarian meal. If you suffer from a food allergy, please let us know as soon as possible and the ship will discuss with the cooks to see what is possible. Keep in mind several ingredients are used in the gally like nuts and gluten. If you allergic to this the cook will provide for seperate dishes and menu’s. However on board and in the galley these ingredients are present. The vessel was built in 1911 in Hamburg, put into service on the river Elbe, and later worked as a stand-by vessel. In 1986 the ship was brought to the Netherlands. Over a period of 8 years, she was completely rebuilt and rigged as a three-masted bark. The rebuilding and conversion to a sailing vessel was carried out under the supervision of the Dutch Shipping Inspection, Bureau Veritas and Register Holland. She sails with worldwide certificates from each of these authorities and she complies with the highest requirements for sailing ships. The ship crosses the oceans following the traditional sailing routes, which are often a long way from the routes of commercial trade. This makes the sailing voyages exceptionally interesting for scientific research. Previous voyages have had special equipment on board taking measurements of air and water which are being used for international research on climate change and meteorology. The ship is sometimes joined by scientists on board who investigate their own research goals and give lectures on their field of experience. During the Antarctica expeditions there will be a guide on board the ship. He/she knows the areas we will be visiting well. The guide gives lectures on board the ship about the flora and fauna we will encounter, prepares you for the landings on shore and will guide you on the shore walks. The ship sails 24 hours a day, seven days a week. Sail handling can happen at any moment, so the crew takes turns in being a wake and sailing the ship. The is is registered as a sail training ship and as such you will be mustered as voyage crew. More so than on a passenger ship, you will get exten- sive safety instructions and we ask you to join in the watch system. Participating in sailing and running the ship is part of the overall experience on board. The level of participation will depend on your interest and physical condition. On deck you work together with the permanent crew. During your visits of Antarctica and South Georgia there is only a voluntary anchor watch. This allows you to get the most of your landings in Antarctica and South Georgia. The permanent crew is divided in two watches, called Port and Starboard. Depending on the Captain in charge, the crew follows a watch system divided in four shifts of six hours (six-on-six-off) during 24 hours or the Swedish Watch system. These Swedish watches work alternating shifts of four hours during the night (2000 – 0800 hrs) and six during the day (0800 – 2000 hrs). The trainees are encouraged to participate in a three- watch system, with four hours on and eight hours off and a split ‘platvoets’. Following this system you will have watch at different times every day so you will see a sunrise one day and a sunset the next. The watches are named after the colours of the Dutch flag and follow up in the same sequence. While on watch you will take turns at the helm, stand lookout and help with sail handling and maintenance.